Face masks for sensitive skin are so hard to find. 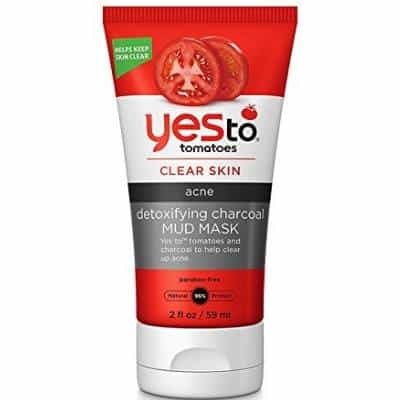 Every time I try a new mask, my fingers and toes are crossed hoping when I peel it off, my skin isn’t tomato red and burnt. But there are friendly masks out there that are super gentle. I found 15 of the best face masks for sensitive skin. No more anxiety-inducing masks for me! Side note: this list isn’t in any particular order. Side note #2: you should still patch test the serum before applying it to your face. I’ll get more into that later. I think this is the best of the best face masks for sensitive skin. I absolutely love it. It is a pure cotton sheet mask that leaves my skin feeling hydrated and happy. But the ingredients will make you nervous if you aren’t into Asian or Korean beauty products. The mask is soaked in snail mucin (a compound in the mucus snails leave behind). If you’ve never heard of it, you’re probably thinking “No way am I going to put snail stuff on my face!” But you should try it. Patch test first, of course. But try it. There are tons and tons of people (myself included) that swear by the stuff and swear by this mask. Besides mucin, the mask has extracts of bee venom, aloe leaf, tea, willow bark, elm, and lichen. Yes, you read that right … bee venom extract. It helps to even out your skin tone. Altogether, the mask claims to moisturize, brighten, lift, and cool your skin and improve wrinkles. And it is free from parabens, artificial colors, oil and alcohol. “Just wow!! I’ll start by saying right now my skin is pretty broken atm. My moisture barrier is wrecked from over exfoliation (battling acne almost 20 years) and I have early signs of aging and a whole host of issues. On top of that I put a product with petroleum on my skin in hopes of helping heal my skin…but I had a bad reaction that left me with a red itchy rash all over my face. I have tried every kind of moisturizer, expensive and not, and everything burns, left my skin feeling tight and dry, or my skin reacted badly. Then I came upon this in someone’s blog and after one use…omg. This is amazing. My poor parched burnt face soaked this up. No burning, no reaction just sweet sweet moisture. I left it on for a while till I felt my skin had soaked up all it could and, honestly, this was the first time my face had felt like real skin, not dry crepe-y paper, in 6 years. I could have cried. Then I sealed with 100% raw shea butter (the only thing I can use lately) and in the morning my skin still felt so happy. I concur. This mask is awesome. Tosowoong is a major Korean beauty brand. And its sheet masks are awesome. The pure propolis mask, in particular, is incredible. All are. But I like this one a lot. Propolis extract actually comes from bees. Not snails this time. The mask has vitamins, minerals and castor oil. It touts itself as a hydrating sheet mask that can hydrate, brighten skin and reduce the appearance of fine lines and wrinkles. Note, the mask has parfum in it which is not to everyone’s liking. It has a strong, honey smell. So be sure to sample and patch test first especially if you are sensitive to parfum. Seriously these masks are lovely. And you can get to sample all of them. 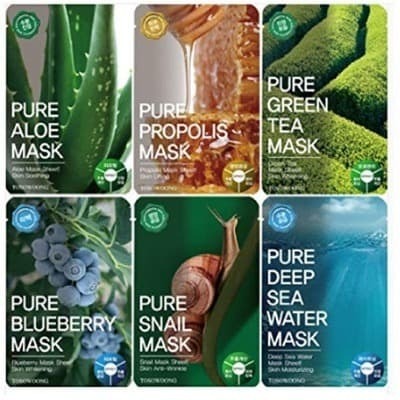 You can choose from aloe, blueberry, green tea, snail and deep sea water masks. But I must warn you – like the propolis mask – they have fragrance. The aloe smells a bit like cucumber and the blueberry smells fruity. The green tea is subtle. But the deep sea water and snail smell like fake perfume. I don’t like the smell but you might be into it. Try them all! The aloe and green tea are super cooling; the deep sea is hydrating and the snail is wonderful. Get the 12 pack which gives you two of everything, including the propolis mask. You won’t regret it! The First Aid Beauty mask is another top face mask for sensitive skin. It is super hydrating and is great for dry, red, uneven and dull skin. The mask claims to nurture, calm and rejuvenate sad, dry skin. And it really does just that. Plus it’s free from pesky parabens, sulfates, and phthalates. In fact, it has colloidal oatmeal, shea butter, cocoa butter and apricot kernel oil. It also has extracts of sea buckthorn, and licorice root. But it contains cetyl alcohol, which can be irritating to some. So be sure to patch test the mask before lathering it on your face. Or if you have some tolerance, you can use it for less time like 5 minutes (instead of the recommended 10 minutes). “This [mask] gave me one of the worst cystic acne breakouts I’ve ever had. I have combination/dry skin that is sensitive and acne prone. If you do not react to the mask, it’ll probably be one of your favorites. This review on Sephora sums up how many feel about it. 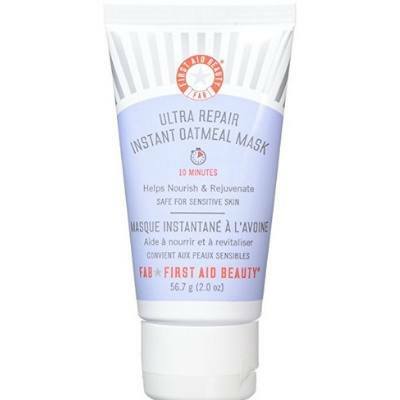 “…This is my holy grail mask it is that good. When I over exfoliated my face the girl at Sephora recommended me [to] buy this and holy cow! She actually took a more expensive product from me and insisted I take home a sample of this mask to try. Give that Sephora girl a raise! If you’re into Asian and Korean beauty masks, then you know all about COSRX. It is an amazing company with an amazing range of products that prominently feature snail mucin. The company has a cult-like following and boasts incredible results. This sheet mask is no exception. It is considered among the best of the best face masks for sensitive skin. It claims to nourish, hydrate, firm and improve the elasticity of your skin. Besides snail stuff, the mask also has firming red ginseng water. Be sure you patch test this serum if your skin has never met snail mucin before. My Beauty Diary offers lots of sheet masks that are great for sensitive skin. But the imperial bird’s nest sheet mask is pretty awesome. It is deeply hydrating and conditioning. And it has some unique ingredients. It has swiftlet nest and extracts of oat, baobab, brown algae, aloe leaf, sugar maple and orange fruit. Yes the mask literally has bird’s nest in it. And it is the best! “I absolutely love the Imperial Birds Nest Masks! … I’m essentially acne-free for the first time in over 15 years, and my pores are less noticeable. My skin tone is also evening out nicely as time goes on. I use a sheet mask pretty much every night as part of my nightly routine… these Imperial Birds Nest masks are the best ones I’ve tried. They’re very thin, but I haven’t had any issues with them tearing, and they fit my face nicely… There is a very light scent to this product, but it’s hardly noticeable to me. This is another one of the best face masks for sensitive skin. Well, all my beauty diary masks are lovely. And this one also stands out. It has pearl extract, aloe leaf juice, pineapple, red algae, yeast complex and collagen. That makes it amazing for rejuvenating dull skin, relieving dryness and strengthening skin. Disclaimer: it does contain methylparaben, propylparaben, perfume and citric acid. So if you aren’t into any of these ingredients, try the other my beauty diary masks. 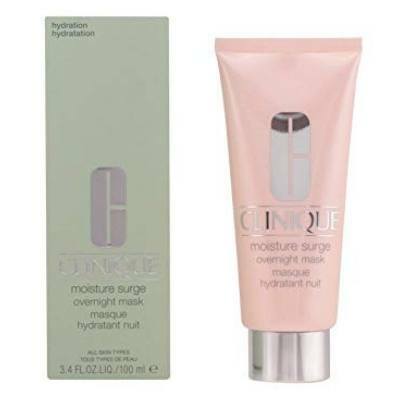 This Clinique mask is oil-free, creamy, hydrating and deeply moisturizing. It is recommended as a night, leave-on mask and boasts of giving you soft, dewy, glowing morning skin. It can be used for all skin types and has shear butter, mango seed butter, and aloe leaf water. But it contains cetyl alcohol. Ah yes another snail mask. 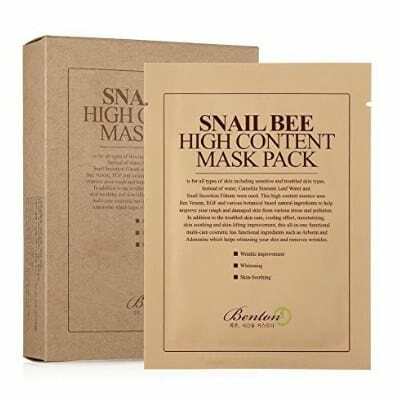 It’s a hydrogel mask that has a high concentration of snail mucus filtrate, pennyworth extract and glycerin. It claims to moisturize, tighten, repair and brighten your skin. And it is so worth it! I’m probably biased because I love me some hydrogel masks. This collection of face masks for sensitive skin is incredible. You can get red wine, pomegranate, broccoli, seaweed, tomato, aloe, lemon, tea tree, rice, avocado, and makgeolli masks. There are also pumpkin, orange, pearl, cactus, rose, lotus, calendula, lavender, cherry blossom, peach, honey, charcoal, olive and ginseng. Seriously, TonyMoly has a lot of face masks for sensitive skin! “This facemask is amazing. I have dry sensitive acne prone skin. When my skin is inflamed and broke out with bad acne I love to use this sheet mask. Speaking of tea tree, Leejiham is known for its Tea Tree 90 essence. Sensitive skin like mine love it. It soothes, and heals irritated, inflamed skin. And Leejiham now has a tea tree sheet soothing mask for your sensitive skin to love too. The mask claims to soothe, nourish and hydrate skin and reduce inflammation and redness. And it has extracts of tea tree, German chamomile, wormwood and ginkgo. These are all natural, amazing antimicrobial and anti-inflammatory ingredients. So you can expect great things from this mask. This is another one of the best face masks for sensitive skin. And it has won many, many face mask awards and accolades. 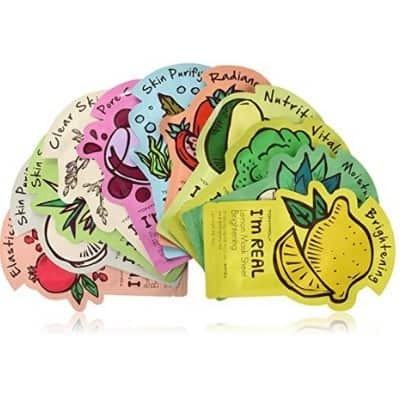 It is a pricey sheet mask that has yeast ferment filtrate, which is loaded with vitamins, minerals, and amino acids that do wonders for your skin. The luxurious mask boasts of revitalizing your skin with intense hydration. It is perfect for improving signs of aging, uneven skin tone and visible pores and dryness. Although exceptional, you should know the mask does contain methylparaben. Say yes to Yes to Tomatoes! This is one of the few mud masks on this list. It has bentonite, charcoal and salicylic acid which control acne and breakouts. Plus it has extracts of tomato, aloe, watermelon, pumpkin and chamomile. And no it’s not like putting vegetables on your face! It does well to calm skin and reduce breakouts. “This product is a must-have for me when my skin is acting up. My skin is very sensitive, so when I feel like I need a reset, this mask is what I turn to. This mask is meant for oily, acne-prone skin, so if that isn’t your skin type, you probably won’t get the same results I did. When I feel like my skin is clogged up from daily life, I’ll purchase this mask to help my skin get out of it’s funk. I have sensitive, combo-type skin that’s very acne prone, and it has been for most of my life. No matter how clean I get my skin, I’ll always end up breaking out. When you use this mask, you can expect your skin to look much better in about 4-5 days, so not immediate results, but I don’t know any skin care system that actually delivers that. There is definitely a “purging” period, where your skin will break out more right after using the mask. This gel mask is incredible! I love how cooling and calming it is. Plus it hydrates, soothes and rejuvenates skin. I mean it has extracts of cucumber, pineapple, chamomile, bilberry, orange and aloe. No wonder it is so refreshingly amazing. The only con to this mask is it has methlparaben, and propylparaben. No bueno! “When I say this face mask literally saved my skin, I’m only being slightly dramatic. After leaving a different (and very potent) face mask on my skin for too long, I was left with skin so red that I genuinely thought I might have to take a trip to the doctors. 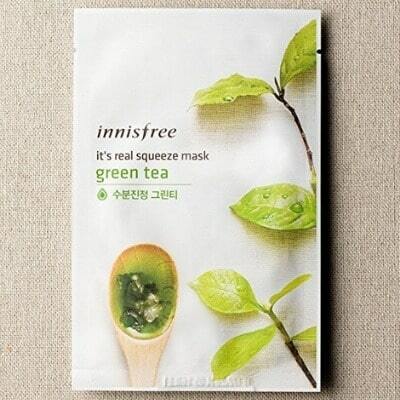 Innisfree has some great masks. But the green tea squeeze mask is pretty special. It has green tea extracts that are soothing. And it has extracts of white lotus, tangerine, grapefruit, orchid, bergamot and orange. It reduces the appearance of large pores so well. But it does contain alcohol, fragrance, citric acid, ascorbic acid and lots of citrus extracts. So be sure to patch test this mask before applying it. According to this review, you won’t be sorry you did! “This is the best sheet mask! It’s soft and the actual green tea product feels amazing on your skin and picks up your complexion. Always patch test your mask before applying it to your face. For sheet masks, cut a little slit in the packaging and squeeze some serum onto your fingers. Apply it to the inside of your elbows and behind your ears. You can reseal your mask packaging and stick it in the fridge. For hydrogels and other mud masks, you can apply a little on the same spots. Behind your ears and your inner elbow are sensitive area. Monitor your skin. If it starts burning, wash it off immediately. If it’s fine, then wash the area after the ten minutes. Check it. You will expect a little redness that goes away quickly. If that does not happen then you should not use the mask. You may be too sensitive for it. What other face masks for sensitive skin do you use? Let me know in the comments below. I’m really glad you have posted this! I have such sensitive skin at the moment and I’ve been struggling to find a product that likes my skin lately! The struggle is real! Try any of these… but patch first! What a great list of masks! Want to try the SK-11 one. Thanks for sharing! Oh it’s awesome. A little expensive compared to the others, but still it’s lovely! I love a good mask, especially in the summer when my skin is so dry. Thanks for sharing these with us! Thanks for sharing your picks with us! I do enjoy a good face mask, The Charlotte Tilbury Goddess Skin Clay Mask is my favourite one. Thank you for this detailed and useful post. I+, interesting to try this Clinique and SK-II mask because I hear only good things about them.